Publicity photo (6"x8"), circa 1930, of actor Tom Mix, who starred in films shot in the Newhall area and every other Western filming location of the silent era and the early sound period. This particular print comes from the archives of the Chicago Tribune and was originally in the possession of William Randolph Hearst's Chicago Herald & Examiner, which The Tribune bought from Hearst in 1956 (when it was the Chicago American). It became the tabloid Chicago Today and lasted until 1974. LOS ANGELES, [obscured] (I.N.S.) 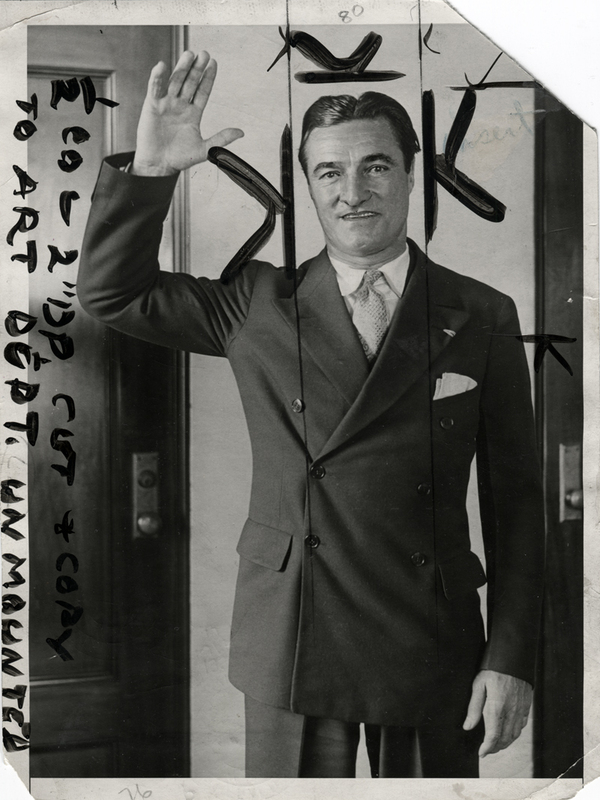  Tom Mix, [obscured] of western pictures, paid the United States $177,420.66 late today to settle three charges against him for failure to file proper income tax returns in 1925, 1926 and 1927. Of that sum $3,000 was paid as a fine, $118,364.11 was tax money and $56,056.55 was the penalty set by the Treasury Department because Mix had not paid [the?] proper tax when it was due. With that out of the way, the print was next used with an Aug. 15, 1931, announcement that Mix would be making a personal appearance when the Sells-Floto Circus came to Hollywood. (Why a Chicago newspaper would run a column announcing a Los Angeles event is anyone's guess, but it's a Hearst paper, so it's probably Louella Parsons' Hollywood gossip column.) Mix toured with Sells Floto in 1930 and 1931 when he was still appearing in movies; after he finished his last film  1935's "The Miracle Rider," a Povery Row picture that grossed an amazing $1 million, for which Mix was paid $40,000  he ran his own Tom Mix Circus from 1936 to 1938. He died in a 1940 car crash. WHAT A DAY it will be for Hollywood when Tom Mix arrives with the Sells-Floto Circus. We'll have not only all the kids in town going to the circus but all the movie folk as well. Tom is due to arrive October 6 with a couple of brand new acts. When he gets here he is going to leave the circus and join up with Universal. His first will be "Christmas Eve at Pilot Butte," by Courtney Riley Cooper and it's a typical Mix vehicle. The public has just been crying for Tom Mix so I am afraid he'll have to leave the circus for the time being and tie up with the talkies. "Christmas at Pilot Butte" is the first of a series of six which Ray Doyle is adapting. He is also doing the continuity. What's interesting is that Mix did sign with Universal, but he doesn't appear to have worked with Courtney Riley Cooper, and he never appeared in a film called "Christmas Eve at Pilot Butte." Cooper did make the film  in 1939, with Johnny Mack Brown, released under its alternative title, "Desperate Trails." Buck Jones is making his sixteenth picture for one studio, and has a schedule of eight a year. Tim McCoy will make eight pictures. Ken Maynard has just completed a series of eight. Hoot Gibson has just completed six pictures, and is to make eight more. A busy guy was Hoot Gibson  committing to 14 pictures while trying to keep his Saugus rodeo afloat during the Great Depression. He gave up on Saugus in 1934 and focused on what he did best  across town in Placerita Canyon.